The bathroom, often the smallest in size among all the important rooms of the house, is actually an area where style and comfort shouldn't be taken for granted. With cleanliness as its main concern, a bathroom's design is also as essential. Bathrooms also have to be styled with class as if you're staying in a 5 star hotel, and today at homify, we're helping you with that! So, get your styling skills ready and take notes from these bathroom models on how to turn your ordinary bathroom into a luxurious one. Even if you're in a Filipino environment, go out of the box with some fusion of other styles! 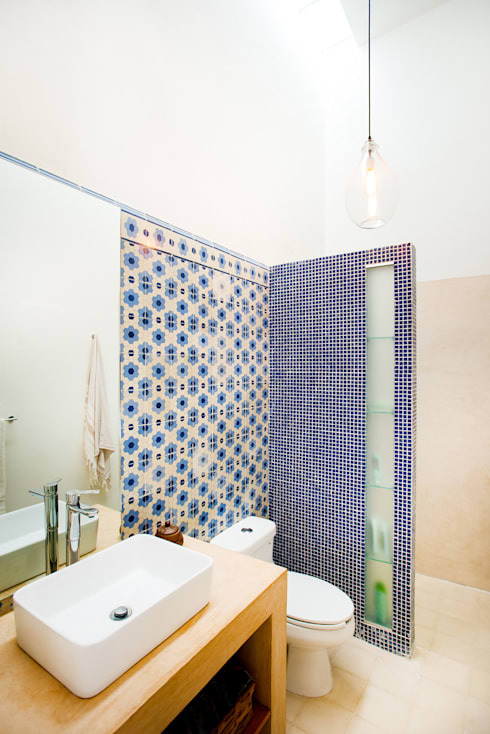 Feel the island breeze of the Mediterraneans with this relaxing bathroom design by Beth Marquez Interiores. 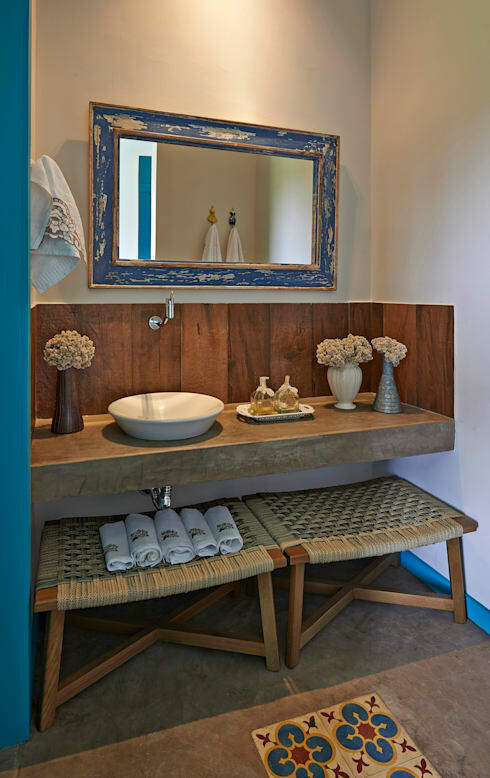 The colors of blue and brown reflect the oceans and natural elements of wood, which ultimately create a warm, homey feel to the bathroom. Add some woven chairs and potted flowers to the sink area to complete the Mediterranean theme. 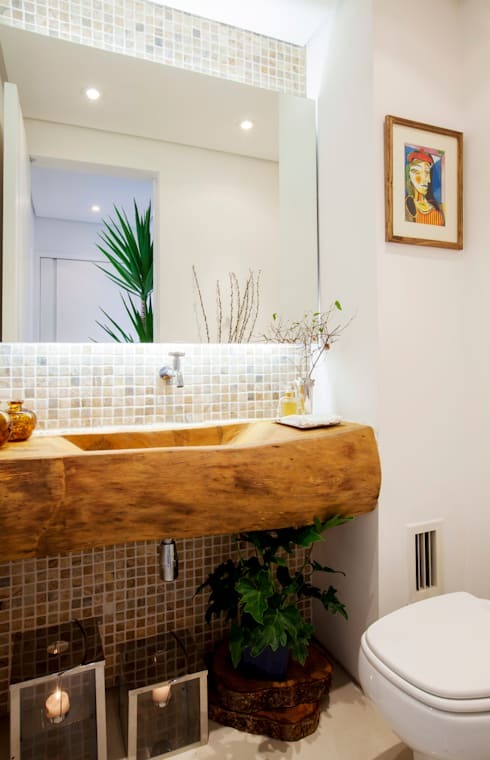 Take advantage of the abundance of wood in the country and incorporate it in the design of your bathroom. Wood can either be clean and smooth or naturally rough. 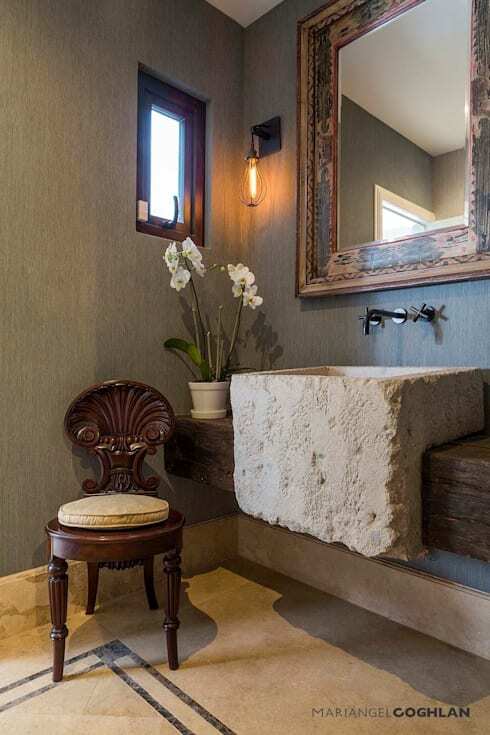 In this cozy bathroom, the rustic charm of this wooden wash basin is given the spotlight. It brings a sense of warmth and comfort to the classic white palette of the room. A luxurious bathroom can vary from its materials -- from dark oak and light maple wood to stone and marble, the choices are endless! This specific design features the element of stone. Rough and edgy, this grey-stoned wash basin is a perfect addition to the vintage approach of the bathroom. Plants are just lovely decorative elements that bring life to any room. 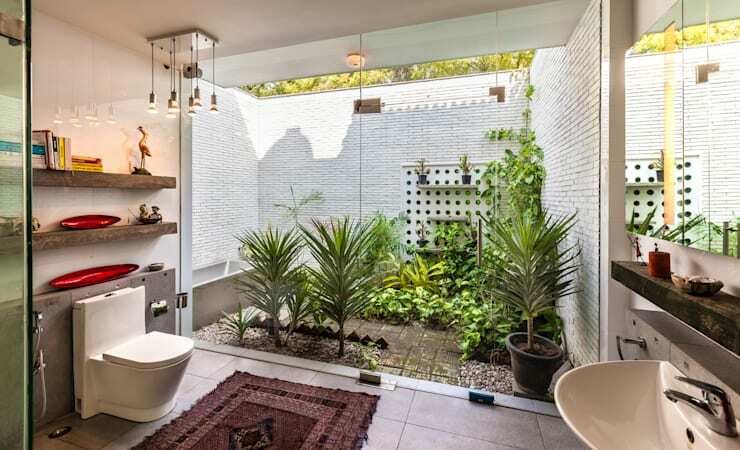 Freshen up your 5-star bathroom with the feature of greenery in an array of plants and flowers. Not only do they beautify your room, but they also bring a lot of health benefits. To spice up your bathroom a bit, be a little more playful with your use of prints and patterns. This can either be through the rugs, mats, and other details of the bathroom or simply through the tiled walls like this design pictured above. Make sure that the contrast of patterns still look in unison -- especially with color. Keep the palette similar, if not the same with each other, and let the patterns do the playing. Check out more bathroom tile designs here! 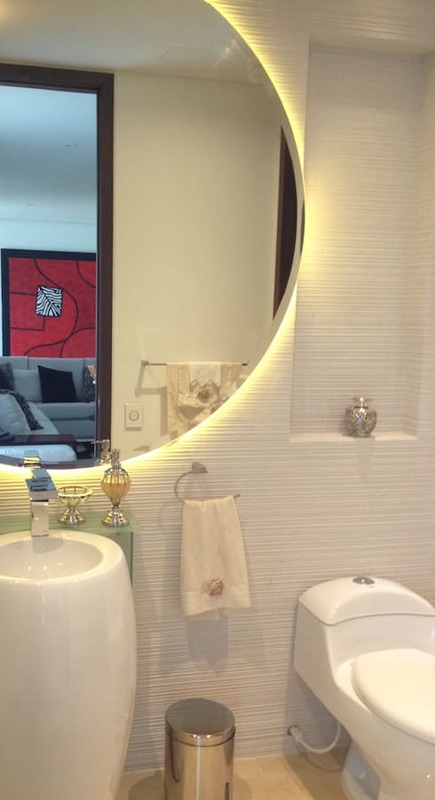 Of course, what could be more luxurious than having a wide and big mirror in your bathroom? It's obviously one of the most essential components of any bathroom. Highlighting it with some accent lights behind will surely illuminate the whole area! Drama -- if you're an over-the-top kind of homeowner, go all out with your creativity and designing visions by not holding back with amazing patterns and styles! 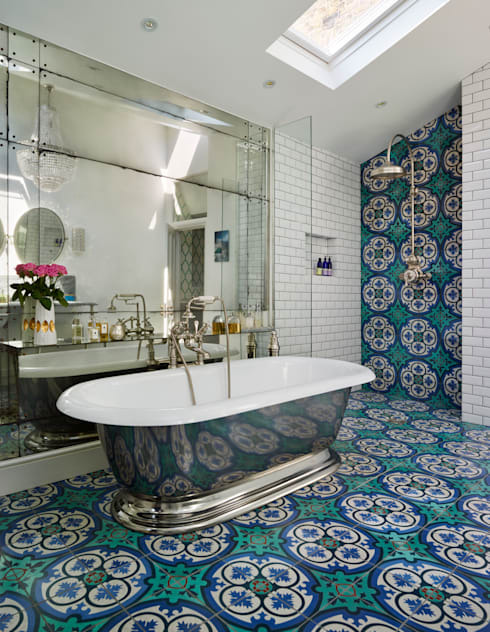 This eye-catching bathroom design by Drummonds Bathrooms certainly makes our eyes pop with its strikingly pleasing wall and floor patterns. 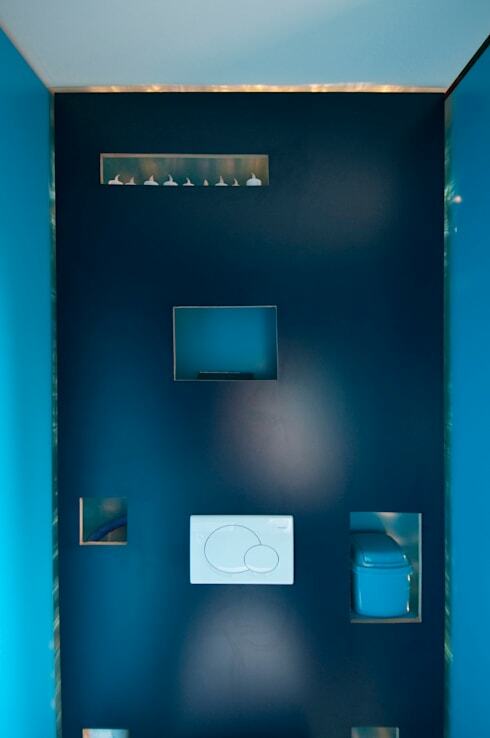 Another striking interior design tip for your bathroom is simply splashing the whole room with a vibrant color. Turquoise, shown above, catches your attention right away!